Arabian Sea, about 20 years ago was known to be a ‘Silent’ or ‘Quiet’ sea and formation of storms/cyclone in this part of north Indian Ocean was very rare. However in recent past it has been very active with producing some very strong or severe Tropical Systems and Monsoon Lows that caused large scale damages in many countries neighboring the Arabian Sea including Pakistan, Oman and India. 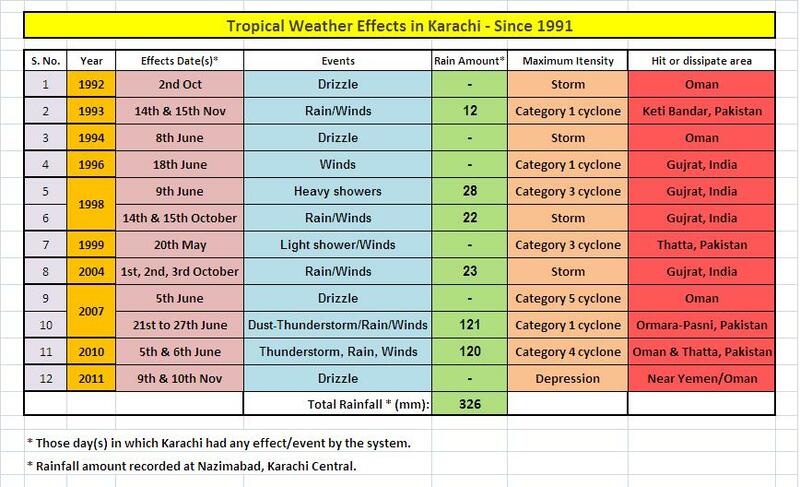 Attached is a brief detail of some of the ‘Tropical Impact Years’ on Pakistani coasts especially Karachi during last 22 years. ← Massive Tornado blasts its way through Oklahoma! is there any chance of storm to develop from this circulations? any chance to hit pakistan? is it the same you were talking about few months ago in Water is Gushing towards pakistan post? This circulation might intensify slightly, another circulation would form in June, I will monitor that one. so are you talking about the pre moonsoon rain from same system or storm? Which same system? First circulation or second circulation? will it turns to cyclone? is it the same which gives pre moonsoon? first one? will it effect pakistan? The first circulation at the moment looks for Oman, the second one, few models suggest might deepen to a low or even a depression and bring rains to western coast of India, few thunderstorms can pop up over Sindh. Yes that Myth has been active since 1998, as per the myth cyclone should affect Pakistan this year. can this myth become true from second activity in arabian sea? Cant say anything right now, but monitoring the second circulation.